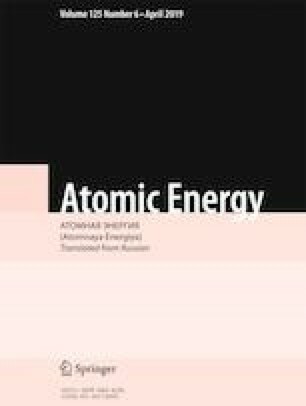 A computational study of 177Lu production in the neutron spectra of 26 nuclear research reactors was performed by two methods: from 176Lu and 176Yb. It is shown that the production of 177Lu from 176Lu with satisfactory specific activity ~7.4·105 GBq/g and higher can be accomplished only in reactors with thermal neutron flux density not less than 1014 sec–1·cm–2. Under long-duration irradiation, not only is the specific activity of the desired isotope reduced but the contribution of 177mLu in the activity increases, as a result of which the quality of the final product is lowered. The accumulation of 177Lu from 176Yb makes it possible to obtain high specific activity in all research reactors and requires using targets with high enrichment with 176Yb and minimum content of 174Yb. In addition, most importantly, the specific activity decreases under irradiation in reactors with high thermal neutron flux density, first and foremost, in SM and HFIR research reactors. Translated from Atomnaya Énergiya, Vol. 125, No. 6, pp. 331–337, December, 2018.